Until now we’ve only seen side views and a couple of spy pictures of the upcoming Kia Soul. Today Kia have given us a look at the Soul from the front and a couple of other details to further wet our appetites. 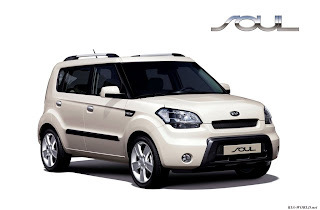 The new Soul will come equipped with a 1.6L (124HP) or 2.0L engine. Europe will get the option of a 1.6L diesel engine. The vehicle sits on a modified Kia Rio platform. It boasts a nice long 100 inch wheel base, 161 inch overall length and up to 18 inch wheels. The wheels are placed near the corners for a smooth and sporty ride. I may trade my current vehicle in for this one. The world premier is scheduled for the Paris Auto Show on October 2. The vehicle should hit the lots here in the US in February 09.